The complete Philips and L'Oiseau Lyre recordings of Bach cantatas made by Sir Neville Marriner, reissued together for the first time. Bach's cantatas vary enormously in scale and style, ranging from festal works featuring elaborate choral movements and large instrumental ensembles including trumpets and drums, to more meditative cantatas for a single voice and only a handful of instruments. The six examples gathered in this new Eloquence reissue tend towards the latter, more intimate vein of expression, but they also encompass stylistic poles defined by varying purposes as either a sacred exposition of Scriptural principles or a rollicking secular entertainment. The Academy of St Martin in the Fields was not yet five years old when, in April 1964, it was joined by John Shirley-Quirk in St Paul's Knightsbridge to record the two most renowned cantatas for solo bass voice. Both Ich will den Kreuzstab and Ich habe genug rank among the composer's most profound contemplations of mortality, and singers of every voice-type have wished to put their personal stamp on them. Reviews at the time praised Shirley-Quirk's assured legato as well as his affecting identification with Bach's acutely sensitive response to text. A little under two years later, the Academy and Shirley-Quirk made a sequel album, featuring another pair of much-loved English singers, Robert Tear and Dame Janet Baker. 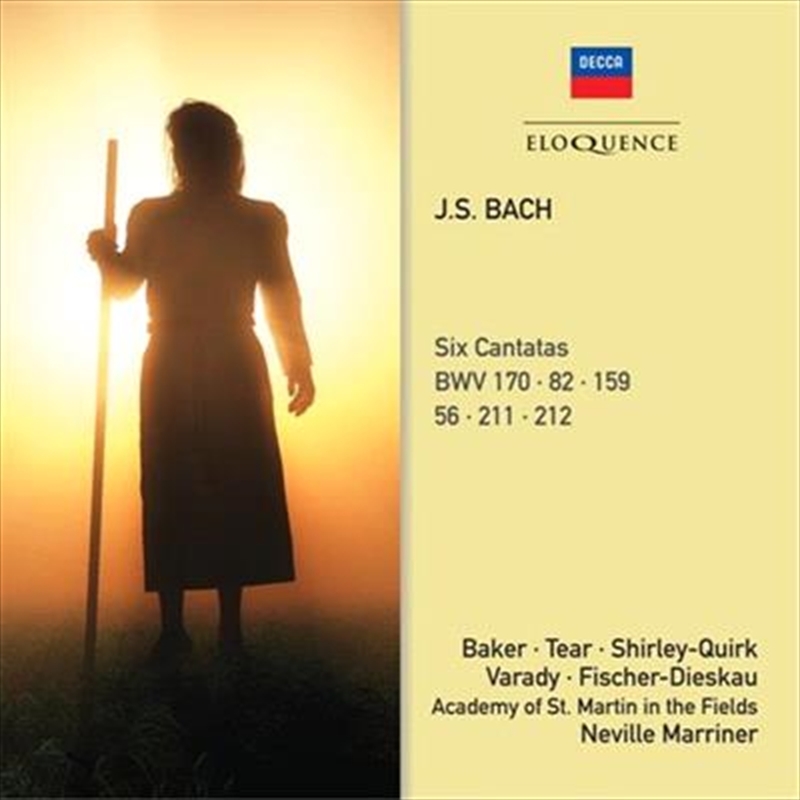 In Vergnügte Ruh' Baker sings hauntingly of the soul's longing for death, but to Shirley-Quirk is allotted the prize of 'es ist vollbracht' in Sehet, wir gehn hinauf gen Jerusalem, one of the most expressive arias Bach ever wrote. Dating from the early digital era, a pair of fun, sometimes satirical secular cantatas features the husband-and-wife team of Dietrich Fischer-Dieskau and Julia Varady: well placed to make the most of Bach's underrated sense of humour, and as ever accompanied by playing of natural and unaffected style from the Academy and Marriner.